We strive to offer our guests a lot to choose from at breakfast time. 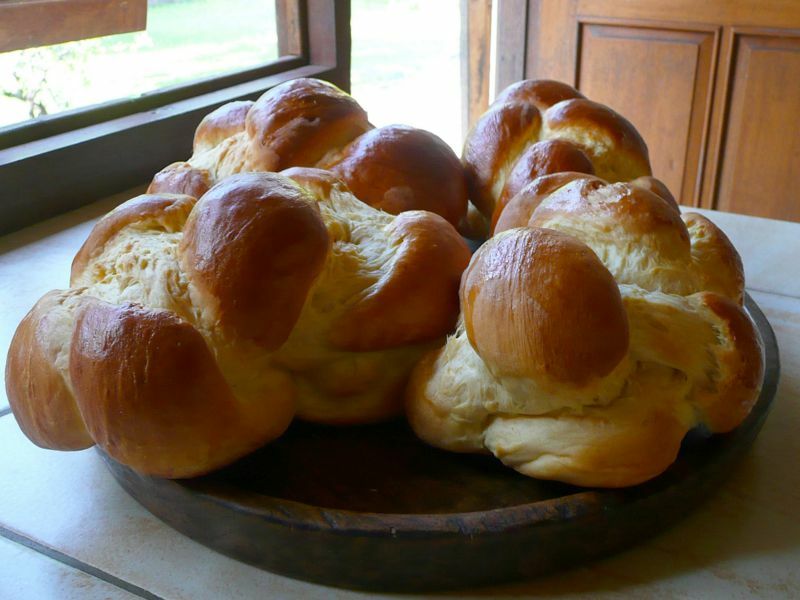 Enjoy your coffee, tea, milk or hot chocolate with a variety of our homemade breads. 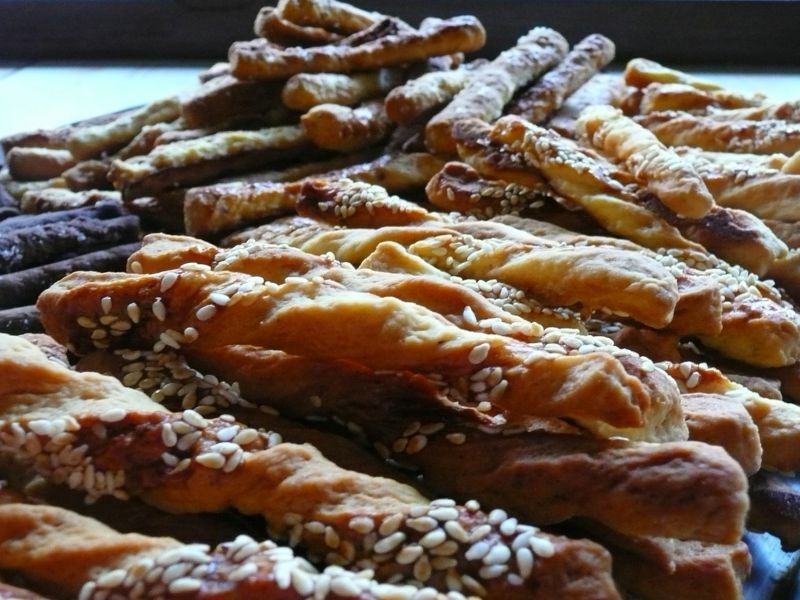 Sunflower seed bread, Hearty dark bread or a swiss tresse au beurre; spread with butter, honey or homemade tropical jams, are on offer daily. 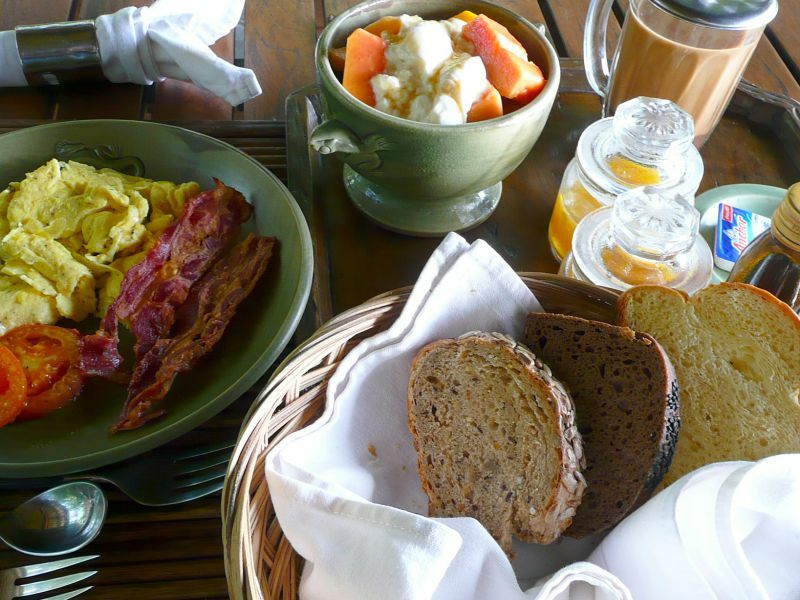 Moreover, we serve a variety of freshly prepared egg dishes, savory jaffles or french toast. For those who have a sweet tooth, crepes and baked bananas are available, too. 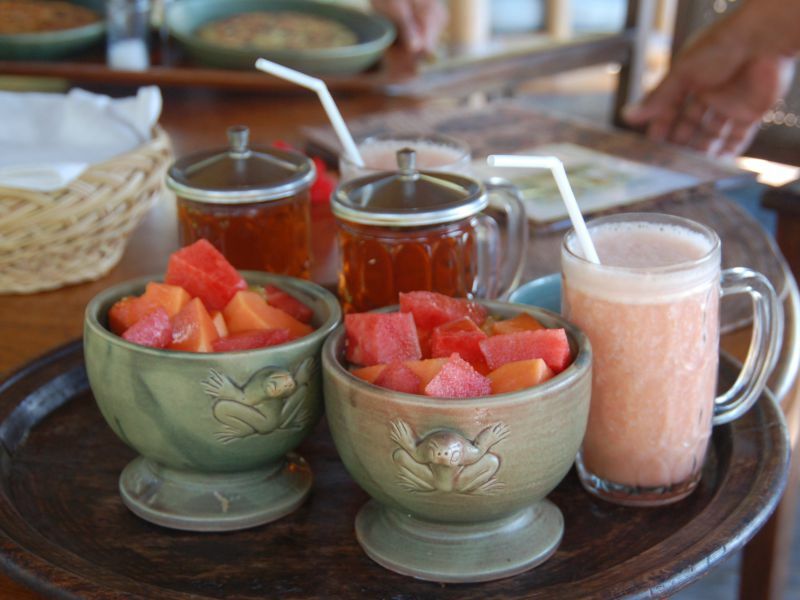 Fresh tropical fruit is always part of our breakfast; enjoy it with our homemade yoghurt or on its own. Breakfast is included in your stay. 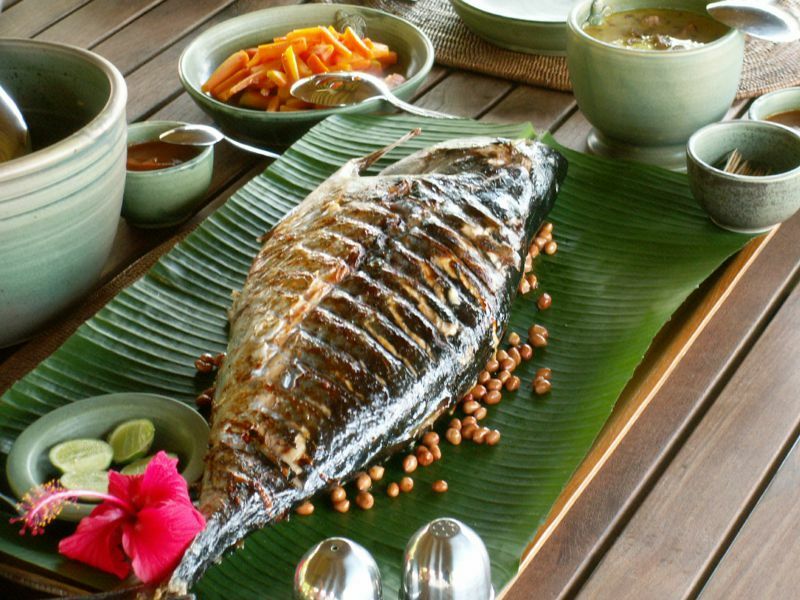 With only a few exceptions, all the food we offer is sourced locally and represents typical Balinese fare. Our dishes are spicy, but not hot. 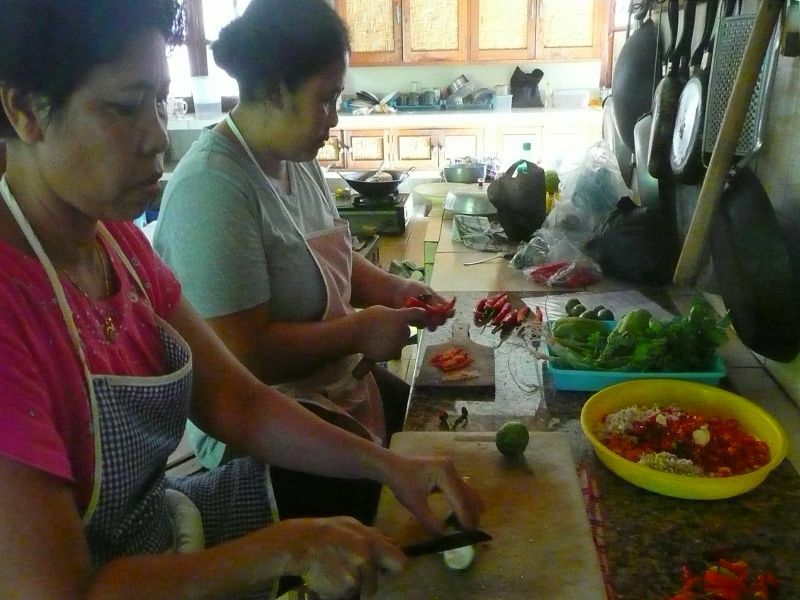 Try the delicious tropical vegetables, and, most importantly, the freshly caught fish. If at all possible, Pak Cilik and his team catch the fish themselves or buy it from local fishermen. Why not catch your own tuna on a fishing tour with Pak Cilik or Nyoman, if that is your thing? The Balinese are big meat-lovers. That is why we often cook with pork and poultry, but not beef (as Hinduist rules do not allow that). 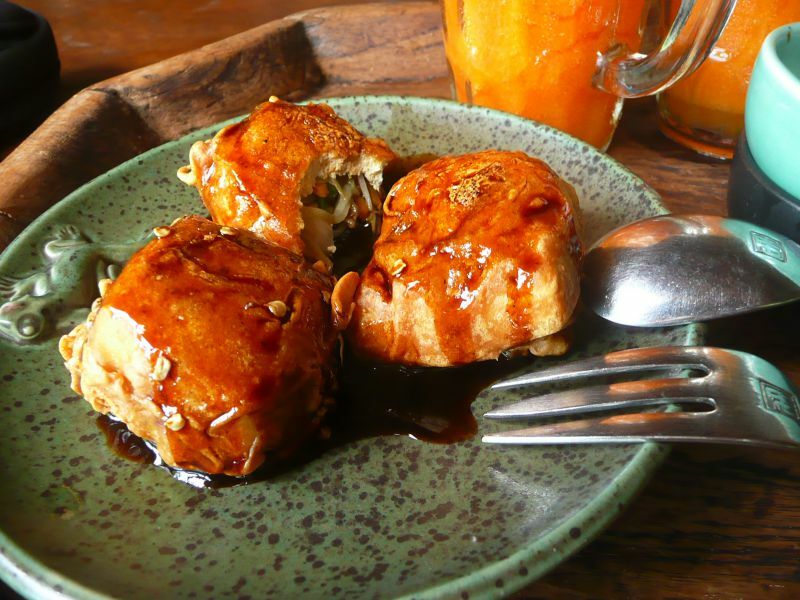 One of our specialties is sweet-and-sour chicken with tamarind and palm sugar – highly recommended! For us, so-called “side-dishes” are very important. We want to prepare rice, pasta and potatoes with special care and in perhaps surprising ways. All three ingredients mentioned above make for interesting and delicious dishes if prepared the right way. 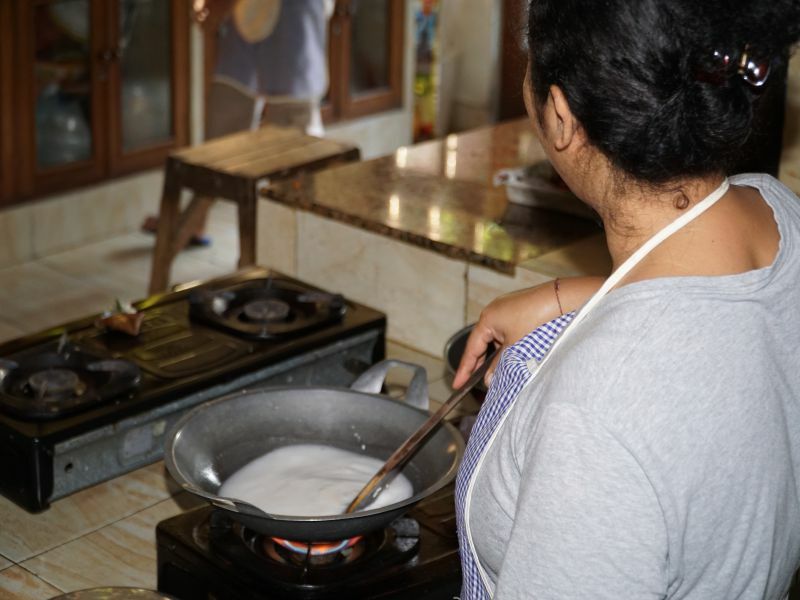 Rice has a special place in Balinese cuisine, as “to eat” means for Balinese people to eat rice. Therefore, it might not even come as a surprise that our kitchen offers six varieties of rice. 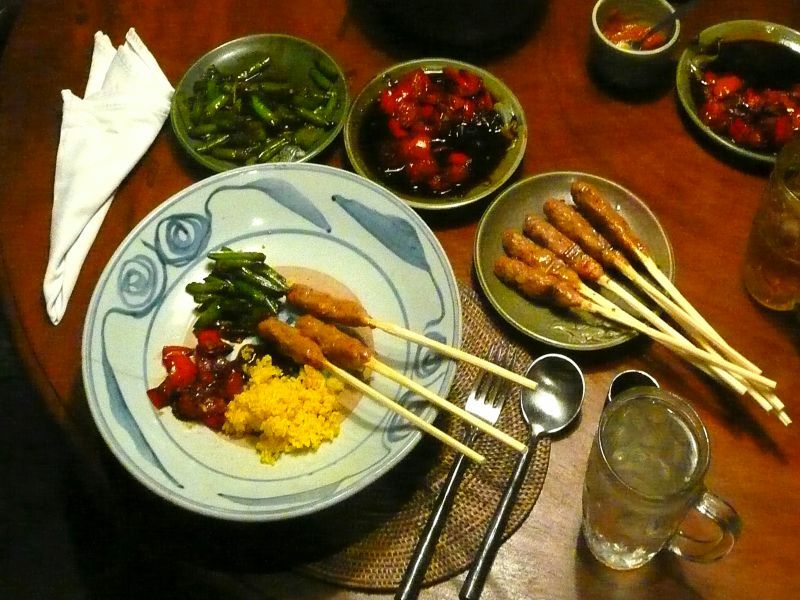 Of course, we strive to fulfil your culinary wishes, too, whether you are a vegetarian or do not like to eat spicy dishes. Your fridge is always filled with cold drinks. Upon arrival, you decide how to stock it: regular water, sparkling water, Coca Cola, Fanta, tonic water, Bitter Lemon and other sodas are on offer. In addition to that, we offer beer, rosé, white wine or (mostly imported) dry red wine. For special occasions, try our surprisingly good dry champagne from Balinese grapes. These drinks will appear on a separate tab. Always available for you are our delicious juices: fresh papaya, pineapple, mango or other juices from seasonal, fresh fruit. With yoghurt, these juices make for a tasty “lassi”. And have you ever tried young coconut water? They make for a refreshing indulgence. Many Balinese love various alcoholic beverages. 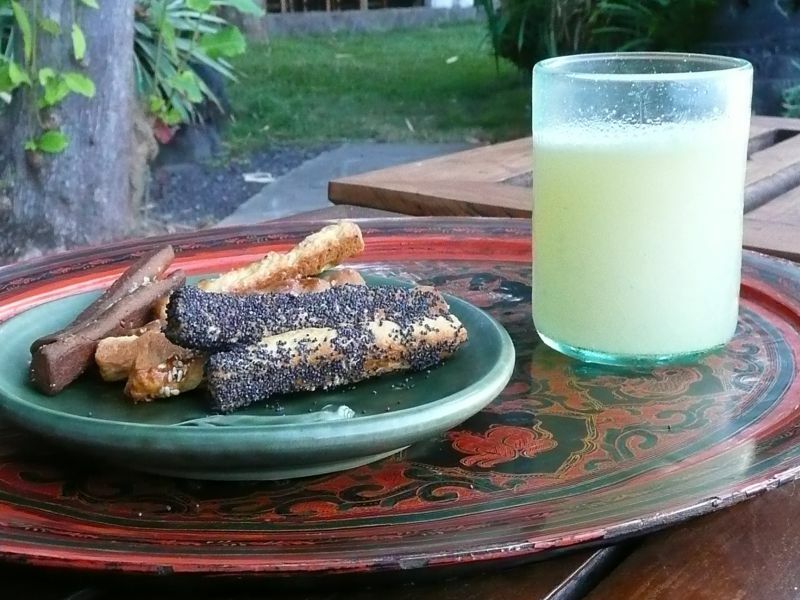 We are happy to offer our carefully chosen local drinks and spirits, like tuak (local palm beer, made in our village, Air Sanih), brem (rice wine from a “secret” facility near Ubud) and arak (rice brandy from southern Bali). 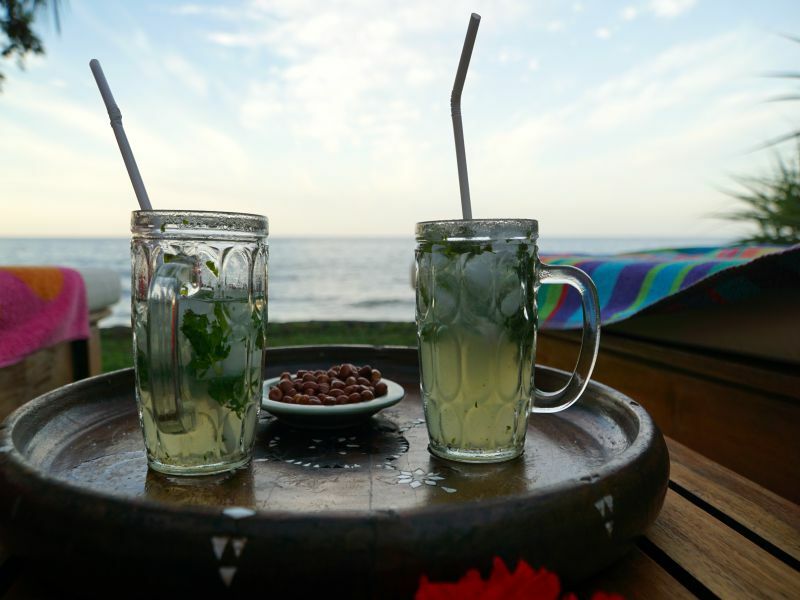 Arak forms the basis for several delicious mixed drinks: Arak Madu (with honey and lime) or Arak with pineapple. For western palates, you can of course also enjoy the sunset with a glass of wine or have a gin and tonic, Campari and soda or Cuba Libre. Or try our Mojito and our very delicious Pina colada! We are happy to send you our menu for further information. On special occasions, we serve our “special menu” or prepare a “babi guling”. For this feast, a Balinese pot-bellied pig is stuffed with herbs and roasted on a bamboo spit over an open fire. This authentic Balinese happening creates an almost ritual atmosphere. Balinese palm beer and coconut milk accompany this hearty meal, which is part of every Balinese celebration. Traditional gamelan music by an orchestra of about 20 musicians and Balinese theatrical dancers with traditional costumes and masks round off the festivities. All of this makes for an afternoon and night to remember! 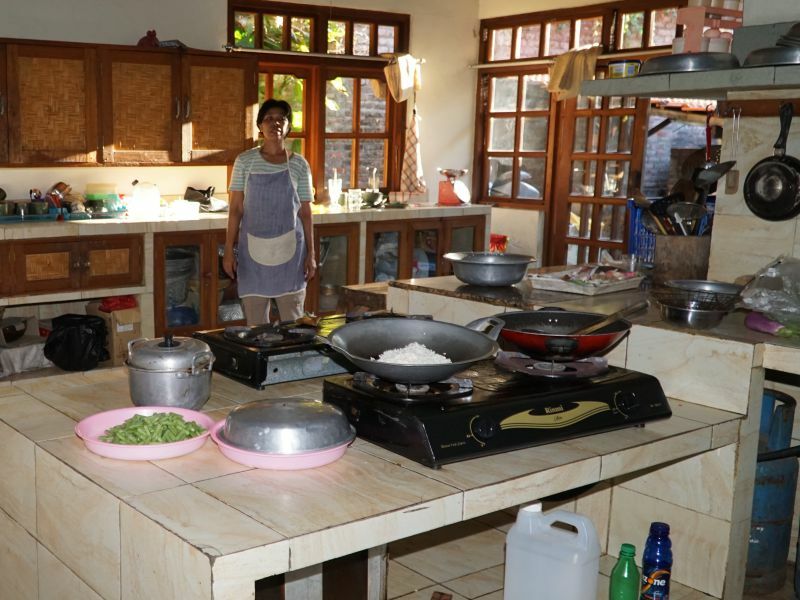 if Balinese cooking intrigues you, you would like to know how to prepare an authentic Sambal or how to use Balinese herbs – our kitchen is not a secret place. Come and watch our cooks as they prepare your meal; our kitchen is always open for you!